A family run storage business based in Shadoxhurst, Ashford we provide self storage solutions for a wide range of uses. 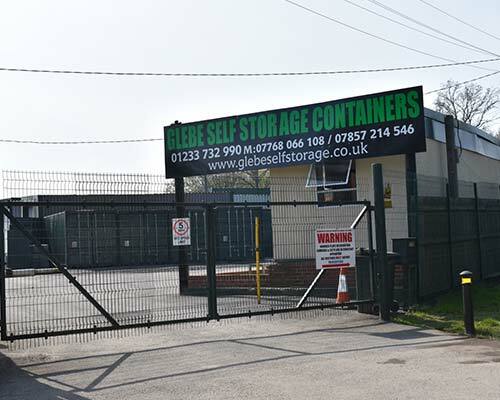 Glebe Self Storage is one of the largest and fastest growing container storage provider in the South East catering for both homeowners and businesses. From 24/7 access, to the highest level of security and ground level access, we cater to homeowners needing to store their personal possessions, businesses looking to keep their spare tools and building equipment with us and internet traders keeping their items they are looking to sell. If you need electrics for your self storage, we also offer this for some of our containers. Get in touch today by calling on 01233 732 990, by mobile on 07857 214546, or sending us a message through our contact form. Homeowners use Glebe Self Storage to keep their possessions safe and with ground level access, they are always easy to retrieve by driving their car or van right up to their personal storage container. You will also have your own fob, meaning only you will be able to gain access through our electric gates. We will always give you the best price possible, including a discount for longer storage periods, such as 12 months for the price of 11. In a prime location, only a few minutes from Ashford, only 10 minutes from the M20, close to the A2 motorway and just 30 minutes from the freight train from Folkestone to Calais, Glebe is the perfect solution to your self storage needs. Whether you are a homeowner buying a new house and needing to store your possessions during the move, or an eBay seller wanting somewhere to put equipment before it's sold, we have two kinds of self storage containers for you to use: 20ft and 40ft, with a third high cube on request. Based a few minutes outside of Ashford, Kent, we provide a comprehensive removals and self storage service for homeowners and commercial customers across the South East, such as Gravesham, Folkestone, Rye, Dartford, Medway, Swale, Tenterden, Thanet, Shepway, Sevenoaks, Canterbury, Hythe, Malling and Tonbridge. Call us today on 01233 732 990, by mobile on 07857 214546, or get in touch through our contact page to speak to one of our professional storage experts about your requirements.